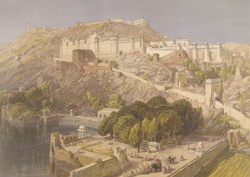 This chromolithograph is taken from plate 10 of William Simpson's 'India: Ancient and Modern'. Sprawling over a ridge, the honey-toned fort-palace of Amber is a blend of Mughal and Rajput architecture and was the seat of the Kachchwaha clan of Rajputs who ruled the princely state of Jaipur in Rajasthan. Amber was begun by Raja Man Singh in the late 16th century, was added to by Raja Jai Singh and Sawai Jai Singh, and finally completed in the 18th century.